The town of Peresvet outside Moscow is home to the testing area of an exotic type of non-lethal weapon – the aerostat. A decision on whether to include blimps into the state's 2018-2025 armament program will be made following testing, to be completed by this autumn. Military analyst Vladimir Tuchkov comments on the prospects for the battle blimps. In his analysis, published by the independent online newspaper Svobodnaya Pressa, Tuchkov explained that the project in question is the multi-purpose mobile aerostatic complex 'Peresvet', created by the Dolgoprudnenskoe Scientific Production Plant, part of the Vega Radio Engineering Corporation. The blimp has a length of 32 meters, and a diameter of 13 meters, with a total envelope volume of 3,000 cubic meters. Peresvet is capable of lifting a 300 kg payload to an altitude of up to 3.5 km (the length of its support cable). At the same time, the blimp can be supplied with up to 4.5 kW-worth of electrical power onboard to power its instruments. — Свободная пресса (@svpressa) 20 июля 2016 г. Commenting on the aerial vehicle's capabilities, Tuchkov pointed out that information on the types of devices used on board the aerostat has not been released. "But we do know that the Peresvet is capable of solving tasks including: a) providing long-range radio communications b) monitoring large areas c) reconnaissance, including visual, infrared, radio and radiological monitoring d) serving as a long-range radar, and e) electronic warfare." "Digressing from this particular model, high-altitude aerostats, according to Radio-Electronic Technologies Concern (KRET) deputy head Vladimir Mikheev, can be effectively used for missile defense. Doing so requires equipping the airship with a phased array antenna, which allows launches of intercontinental ballistic missiles, and their warheads' flight paths, to be recorded." At present, Tuchkov noted, "this idea remains only a concept, but one entirely possible to implement. Before embarking on the creation of such ambitious programs, it will be necessary to convince the senior command of the Aerospace Defense Forces of the need to revive the country's aerostat and airship building sectors." "Not so long ago," the analyst recalled, "during the Great Patriotic War, and in the postwar period, dirigibles were widely used in the country's system of air defense, both to monitor the skies and to repel airstrikes via air-based boundaries. Of course, these functions are no longer of any interest to anyone; the intelligence-gathering role of stratospheric balloons has proved much more enduring." 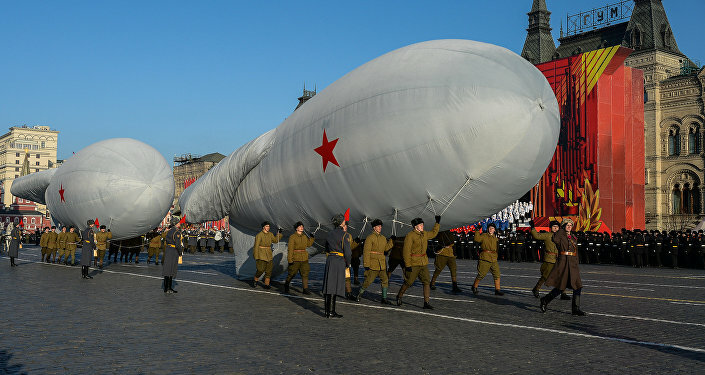 Servicemen marching with mock blimps to mark the legendary November 7, 1941 Military Parade on Red Square, Moscow. In the 1950s, the United States began sending large numbers of spy balloons (from 200-300 in the most active years) equipped with powerful cameras to Soviet territory from bases bordering the USSR. After flying over Soviet territory and taking its pictures, the aerostat would drop a container into the water, equipped with a radio beacon and a distinctive orange dye, for recovery. 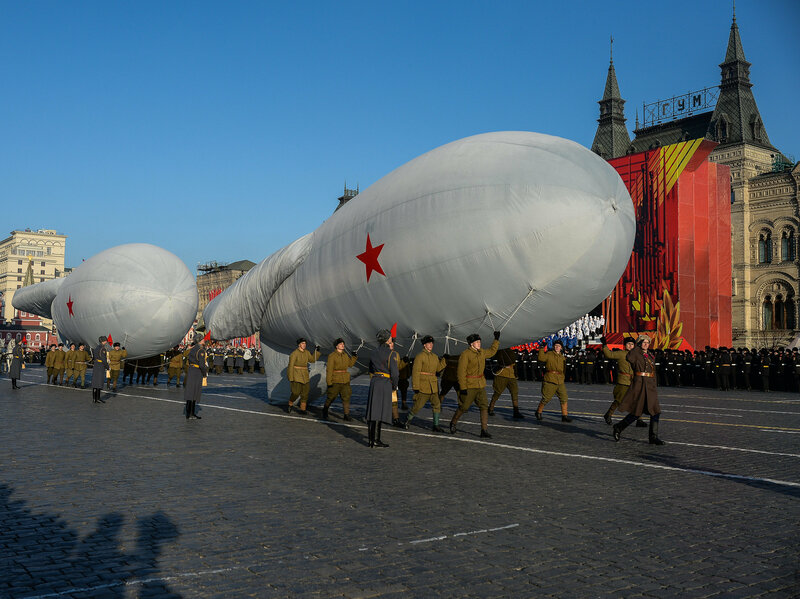 "These compact balloons became a huge problem for Soviet air defense forces," Tuchkov noted. "Anti-aircraft guns could not hit the target, which flew at altitudes of up to 30 km. Interceptor aircraft also had a flight ceiling which was much lower. Hitting the balloons with air-to-air missiles was also extremely difficult," with "the huge difference in the speed of the slow flying spy probe making it difficult for pilots to accurately lock onto the target." "Due to the extreme difficulty in destroying these probes, every pilot who managed to destroy one of these spy balloon was awarded the Order of the Red Star," a medal awarded for great contributions in the defense of the USSR. "These air raids, which were highly effective, continued until the late 1960s, stopping after the Americans developed the U2 high-altitude spy plane, and after the USSR developed effective anti-missile weapons." Incidentally, Tuchkov noted, the Dolgoprudnenskoe Scientific Production Plant was created in 1956 in response to the US 'aerostat strategy'. Over its history, the design bureau developed balloons and airships from as small as 4 cubic meters to as much as 3 million cubic meters, with the capacity to lift between 1.5 kg to 6.5 metric tons, and a working height between 1.5 km and 45 km, with flight duration up to 20 days. "In the 1990s, the Plant continued its research. However, a lack of funding prevented its projects from being realized. Among the unrealized projects is a marine radar surveillance blimp, designed to explore sea-based economic zones. The project is very promising in terms of both its cost-effectiveness and ease of implementation. The airship is capable of OTH radiolocation of waters and the surrounding airspace." The Podsolnukh ('Sunflower') OTH radar, which is significantly more expensive, has similar capabilities. Ultimately, Tuchkov explained, there are serious advantages to the use of airships. "Airships are cheaper to use than airplanes and helicopters, not least because they are unpiloted, and use less fuel. There are even advantages compared to drones. Firstly, an airship has a greater lifting capacity, and therefore can take more equipment up with it. Secondly, the threat of accidents due to technical problems is virtually eliminated. Of course, this does not apply to aerostats equipped with hydrogen, but their use was abandoned a long time ago." "Airships have another significant advantage: they are difficult to detect on radar due, since they contain virtually no metal parts. The Dolgoprudnenskoe Scientific Production Plant has advanced their projects' qualities in this area even further, through the use of shell materials virtually invisible to radar waves." And the Dolgoprudnenskoe Plant is not the only player engaged in the development of aerostats for military applications. The Vladimir Region-based Augur-RosAeroSystems also has a number of interesting proposals. One particularly impressive project is Augur's Puma blimp, which has the capability to lift a 2.2 ton payload to an altitude of 4.4 km, a flight time of up to 30 days, and a power capacity of up to 40 kW. The aerial vehicle can be equipped with a variety of equipment, including radio-electronic warfare equipment. "Augur has also made considerable efforts in the creation of manned airships. In 2018, the company plans to test the Atlanta, set to have a 60 ton lift capacity, and a 2,000 km flight range. The company expects this project to find interest in the Ministry of Defense. Naturally, commercial exploitation is also possible." Still, Tuchkov noted, the creation of airships for use by the military is a risky venture. In the late 2010s, the US firm Worldwide Aeros began the creation of a heavy transport airship dubbed the Aeroscraft. The Pentagon soon showed its interest, becoming the co-financer of the project, which promised to cheaply transfer heavy equipment and personnel (up to a battalion-worth) across long distances. A prototype with a 40 ton lifting capacity made its first flight in 2013. The project came to naught when the Tustin, California hanger at which it was based collapsed in late 2013, destroying the prototype. 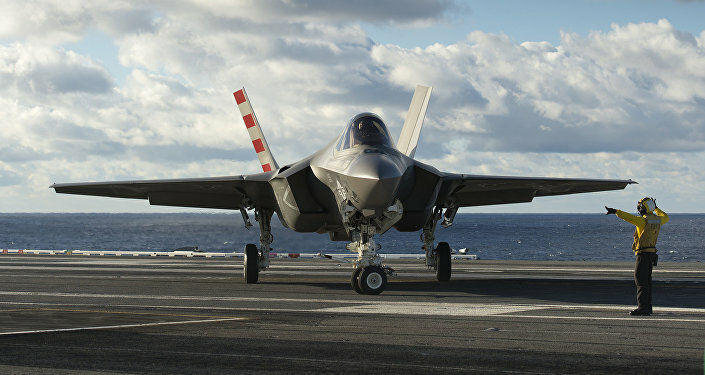 The company began a lawsuit against the Pentagon, which soon rejected the project. "This is not the most ambitious US military project in the field of dirigibles to have 'deflated in the air'. In the mid-2000s, DARPA, the agency specializing in the creation of breakthrough military technologies, announced an airship project with a 1,000 ton lifting capacity, and a range of 22,000 km. That project was abandoned due to the fact that the super-airship's enormous cost of development far outweighed the expected results." Nonetheless, Tuchkov noted, "the Pentagon remains interested in the creation of an intelligence-collecting suborbital aerostats operating in the upper boundary of the stratosphere (i.e. at an altitude of about 80 km). Its interest is understandable. Such an apparatus has capabilities not much different from a satellite in low orbit, and would repay with interest, since a rocket is not required to launch the balloon." "The only question," according to the analyst, "is whether American engineers will be able to create a stratospheric balloon in a near airless space. At present, the absolute record belongs to the Japanese, who reached a record altitude of 53 km in May 2002." 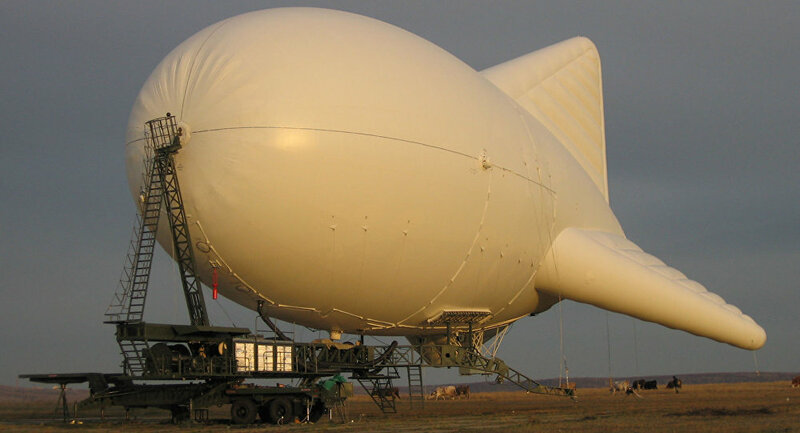 "Tethered aerostats with more modest characteristics have long been used by the US Army as observation posts, equipped with tele and infrared cameras. In the early 2010s, the Pentagon decided to strengthen its fleet of unmanned airships, incorporating them into their air and missile defense systems. Now, this initiative, under the $3 billion JLENS program, is beginning to be realized. Testing is being conducted at a US Air Force base in Maryland on customizing the vehicles for the detection of low-flying cruise missiles. They are expected to be accepted into service in 2017 or 2018." In this sense, the analyst suggested, Russian aerostat engineers are moving in the right direction.